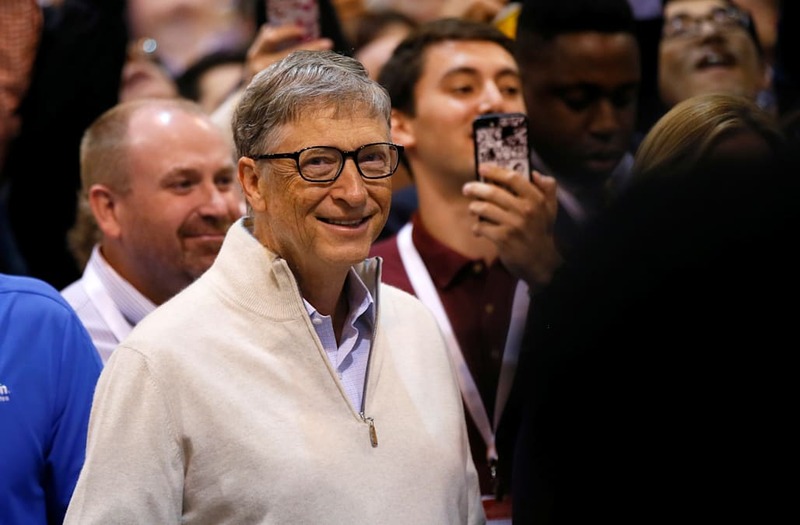 Billionaires like Bill Gates, Mark Zuckerberg and Warren Buffett have massive amounts of wealth, but while certain parts of their lives are glamorous, there are frugal practices that have set them apart. In fact, many billionaires decide not to live lavish lives; the CEO of IKEA famously flies economy and drives a 1993 Volvo. Here are some modest habits of people in the billionaires' club. The billionaire landed the top spot as the richest person on Earth on The World's Billionaires 2017 list by Forbes with a listed net worth of $86 billion, was chairman of Microsoft up until 2014, and is co-chair and trustee of The Bill and and Melinda Gates Foundation—but there are aspects of his life that aren't so exclusive. Gates reportedly said his watch costs $10 at POLITICO's Lessons From Leaders inaugural event in 2014. He also prefers an unpretentious look in clothing, preferring simple shirts, pants and sweaters, like a Midwestern dad. *This is not a picture of Bill Gate's trampoline room. *This is not a photo of Bill Gates' kitchen. Gates also revealed some other down-to-earth habits when Reddit user briannnf asked him about "something you enjoy doing that you think no one would expect from you" during an Ask Me Anything session in 2014. He wrote, "playing bridge is a pretty old fashioned thing in a way that I really like. I was watching my daughter ride horses this weekend and that is also a bit old fashioned but fun. I do the dishes every night – other people volunteer but I like the way I do it." Gates also saves a lot of money on food, with unpretentious tastes: "rooms full of Diet Coke" and bags of McDonald's burgers for business lunches. Forbes lists Zuckerberg's "real-time" net worth at $66.2 billion. He still dresses like a college student rushing to class, however. The Facebook mogul is known for his casual look— specifically, a gray t-shirts and blue jeans (although the New York Times also reported that sometimes, he wears a hoodie, Adidas sandals and Ray-Bans). When asked about why he sticks to the same shirt every day during a Q&A session at Facebook's Menlo Park Headquarters in California, Zuckerberg reportedly responded, "I'm in this really lucky position where I get to wake up every day and help serve more than a billion people," he said. "I really want to clear my life to make it so that I have to make as few decisions as possible about anything, except how to best serve this community." The Facebook executive posted this photo back in 2016 after his daughter, Max, was born. Dan Schawbel, founder of Millennial Branding and author of Me 2.0, told Forbes about the meaning behind Zuckerberg's clothing choices. "Famous business people and politicians are known to be consistent with their wardrobe because it's their brand identity...It's who they are, how they want to represent themselves and make a statement. It's not about what you wear, but what you accomplish. [Mark] Zuckerberg, for instance, wears casual clothing because he represents the entire generation of young people who don't want to wear suits to work," he told the publication. Zuckerberg also has a modest car. The Wall Street Journal reported in 2014 that Zuckerberg drove a black, stick-shift Volkswagen GTI. More recently, he seems to have upgraded to an Acura TSX. Relatively inexpensive cars are, by the way, favored by many of the richest Americans. Former Google CEO Eric Schmidt drives a Ford Hybrid Fusion. Like Zuckerberg, the the Apple executive also had a signature look before he passed away in 2011. Jobs would come to work in black mock turtlenecks, New Balance sneakers and Levi's jeans, according to the New York Times in 2011. Steve Chazin, a former Apple marketing executive, told the New York Times in 2011 about the meaning behind the mogul's clothes. "He didn't want any individual to kind of overshadow the brand, and that includes him," Chazin told the publication. In 2010, Jobs was #136 on The World's Billionaires list by Forbes, with a net worth of $5.5 billion. The CEO of Berkshire Hathaway and "Oracle of Omaha" came in second place on The World's Billionaires 2017 list by Forbes, with a listed net worth of $75.6 billion, but reportedly has lived in the same house in Omaha, Nebraska since 1958. The Wall Street journal reported in February 2017 that also he listed his California beach house for $11 million. But if you like fast food, here's the real kicker— Buffett has earned special privileges at McDonald's, and eats their breakfast food in the morning. Buffett showed CNBC's Becky Quick what he was carrying in his wallet on a plane ride to China in a 2007 interview. "And, ah, here we have my McDonald's card which lets me eat free at any McDonald's in Omaha for the rest of my life. So that's why the Buffett family has Christmas dinner at McDonald's. It explains a lot of thing," he told Quick. He also showed her a special card from Johnny Rockets, among other items. Buffett may be relatable in his love for McDonald's, but make no mistake about his level wealth and business success– he reportedly owns a private jet. This article America's best-known billionaires drive Volkswagens and eat at McDonald's appeared first on Ladders.